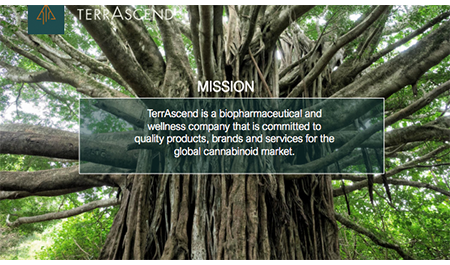 TerrAscend is a biopharmaceutical and wellness company that is committed to quality products, brands and services for the global cannabinoid market. TerrAscend strives to create and deliver quality products and services that meet the evolving needs of the cannabis market. The Company provides support to patients through its wholly-owned subsidiaries, TerrAscend Canada, a licensed producer of medical cannabis under the Access to Cannabis for Medical Purposes Regulations, and Solace Health Network Inc., a patient navigation and education platform led by health care professionals. The company also has a 50% stake in Solace Rx Inc., a drug preparation premises for non-cannabis formulations. TerrAscend operates complementary business units that leverage its location, personnel, and strategic vision, providing a uniquely holistic business offering. TerrAscend believes that the cannabis space is much broader that just cultivating the crop, and as such, the company is working with strategic partners to develop businesses that complement the cannabis plant.